Lynne Sweetman: Hey just wanted to let you all know that I was in south Queensferry tonight at a pub called the ferry tap, they are dog friendly and offer fresh water and bowls for dogs. I was told dogs are welcome at any time throughout the day or night and I’ve heard their bar food through the day is very good! Well worth a visit. This is a great stop. 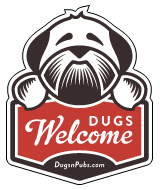 Very dog friendly, great food, and relaxed atmosphere. Will definitely visit again. Take my little dog here when my fiancé and I go for lunch! Food is great, water available for the dog and love the traditional décor!